Be it men’s or women’s team, Australia and New Zealand have a strong rivalry going. Something that crosses over the gender line. points and a rating of 119. This team was the champions in 2000. They are very much in the run for the cup this year. This is because they have a balanced squad and have four players who played domestic cricket this summer in England are used to its unpredictable weather. 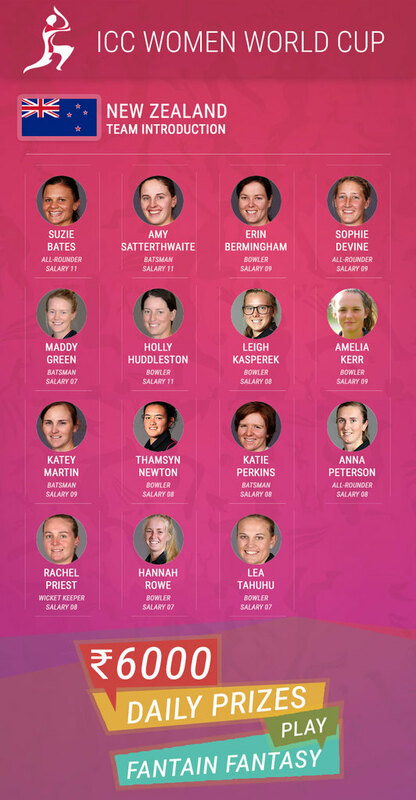 Suzie Bates (c), Erin Bermingham, Sophie Devine, Maddy Green, Holly Huddleston, Leigh Kasperek, Amelia Kerr, Katey Martin, Tamsyn Newton, Katie Perkins, Anna Peterson, Rachel Priest, Hannah Rowe, Amy Satterthwaite, Lea Tahuhu. 29-year-old Captain, Suzie Bates (right-hand bat and right-arm medium) has been playing for over a decade now. Her last match was against Australia in March earlier this year. She is very much in touch with the game and in-form. She is a batting allrounder who plays in the top order. Named ICC Women's ODI Cricketer of the Year along with player of the 2013 world cup Tournament, the captain is the safest bet if you are thinking of your Fantain Fantasy lineup. 30-year-old Amy Satterthwaite (left-hand bat and right-arm off break) - Watch out for her. Known as the branch because of her height, she can contribute both with the bat and the ball. She has topped the batting averages in 2016 women’s World T20. Fear her. 27-year-old Sophie Devine is an integral part of her team. Starting off as a bowler, today she has steadily improved her batting big time. She scored three fifties in March this year at the T20Is. She’s in form and form is very important in the game. 16-year-old Leg Spinner Amelia Kerr became a sensation in a matter of two years. She is a treat to watch, irrespective of the format. When she was 14 and on the team, her then skipper of Wellington Blaze - Sophie Devine - predicted that she could be a world-beater. She looks like she is on the right path. New Zealand look like one of the top contenders for the Cup this season. They have all the right weapons clicking the right time. It is time to go for the kill.